This incense is a traditional recipe for her that has been used for hundreds of years. It contains love and luck drawing spices and herbs. It is said burning this incense on charcoal will bring dreams of your lucky numbers. Add a teaspoon to a pot of boiling water and let it waft through your home-this will bring love. 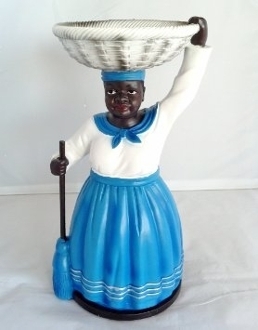 You will receive a 12 inch, unbreakable RESIN statue of La Madama featuring her traditional good luck symbols of her broom and offering basket held upon her head. A TWO full ounce glass jar with cork of my La Madama incense formula that contains finely milled cinnamon, cardomom, coriander, clove, and a secret ingredient. It is adorned with a classic image of La Madama and will serve as a perfect addition to any altar, along with TWO charcoals. You will also receive ONE full ounce of my special Madama oil formula! The incense and oil alone in these large sizes are worth $46!